The Post's award-winning front page: judges described it as "haunting"
The Bristol Evening Post has won two awards at the Society of Editors’ Regional Press Awards 2011, announced on 11 May at the Park Plaza in London. The 2011 awards celebrate the best of British regional newspaper journalism during 2010, and are organised on behalf of the industry by the Society of Editors with the support of the Newspaper Society, Hold the Front Page and the Press Association. 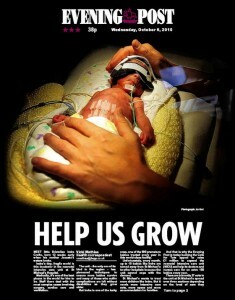 The Evening Post won Front Page of the Year for “Help Us Grow”, described by the judges as “a confident, haunting and dramatic way to launch a powerful campaign…The layout was simple and uncluttered and allowed the stunning picture and understated headline to tell the story”. The page launched the “Cots for Tots” appeal, which aimed to raise £1 million to expand the neonatal intensive care unit at St Michael’s Hospital in Bristol. The Bristol Evening Post also won Supplement of the Year for its monthly Banter magazine, written by and for secondary school students, a “brilliant and original concept which effectively involved children in local newspapers”. The judges said that despite the fact that work experience sometimes had limited value, producing a magazine for students by students was a “superb” idea. One of the judges, Jon Slattery, noted that this year’s Regional Press Awards had got back on track at a difficult time, with “not a shagging footballer or unfaithful tv celeb in sight”. The Bristol Evening Post was founded in the 1930s as a counterpoint to the then Lord Northcliffe’s bid for a media monopoly in the city. Bristolians contributed £1 each for a share to fund it, and until its recent Northcliffe Media ownership, every copy carried the masthead motto “The Paper All Bristol Asked For and Helped to Create”. Congratulations from Bristol NUJ to the award-winning Evening Post photographer and subs for their inspiring design, and to the young people on the Post’s Banter team for all their brilliant work.